Home / Solutions / Case Studies / Road / This complex lighting solution provides safe and comfortable driving conditions. Opened in 1981, the Puente de Rande is one of the world’s largest cable-stayed bridges, and an iconic feature of Spain’s Ria de Vigo estuary. In 2017, a project was completed to add two more lanes to the bridge to cope with increasing levels of traffic, making the Puente de Rande the first cable-stayed bridge to be extended. The new lanes attached to the bridge’s main pillars increased its capacity by 42%, so that it can now carry up to 95,000 vehicles a day. The bridge’s new lanes presented a unique lighting challenge. The EN 13201 standard classifies the road as ME2 - the second highest category - meaning it requires high light levels and low glare. However, tall poles like those installed on the main section of the bridge could not be used on the new lanes because they require deeper foundations, so a low-level solution had to be found. And because of the difficulty of maintaining bridges, any solution had to be easy to maintain and long-lasting. This was the challenge Thorn faced. Thorn’s solution uses our Orus LED luminaire, mounted at a low level to the sides of the road. Orus LED incorporates Thorn’s patented Flat Beam® technology - an optical system that creates extremely sharp and controlled distribution of light. A total of 320 units were installed at a height of just 0.9m and spacings of 10 metres. The luminaires feature the same finish as the rest of the structure itself, making the installation visually coherent and as unobtrusive as possible. 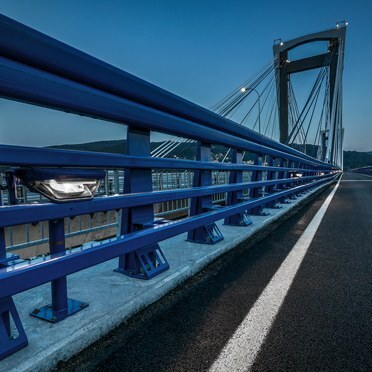 The Flat Beam® optics provide greater night-time driving comfort and better visibility of obstacles and pedestrians, as well as any irregularities in the road surface. Thanks to the low height of the luminaire, direct glare to drivers is avoided. Concealment and shadows are avoided, with light distributed in front, behind and below the vehicles. The innovative solution facilitates visibility and guidance and brings a new visual identity to the bridge. 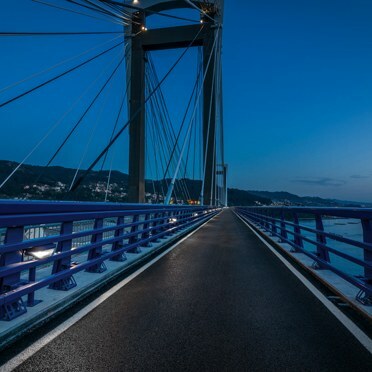 Maintenance is kept to a minimum thanks to the long life of the LED light source, and the luminaires are designed to cope with extreme weather conditions and the coastal environment. The low height of the luminaires also keeps maintenance safe and simple. Thorn understood the demands of this unique and complex project, and came up with a solution that not only provides safe and comfortable driving conditions, but also positively impacts the appearance of an iconic structure.